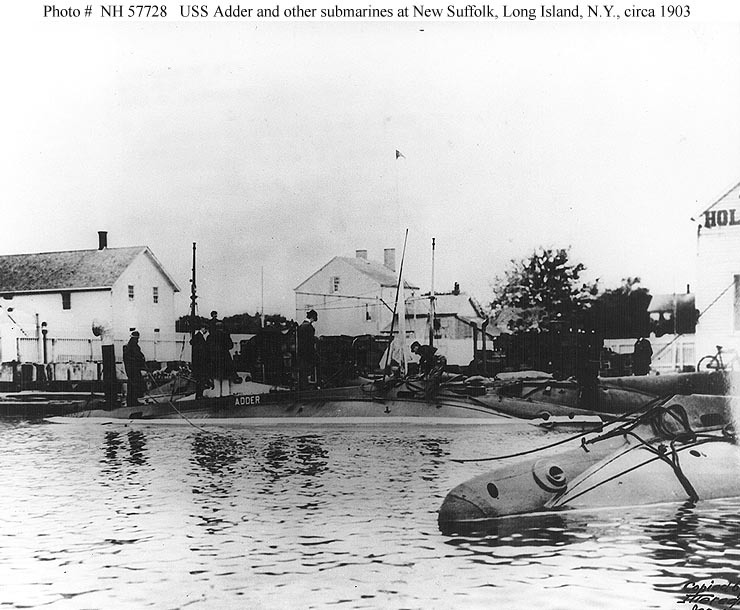 Adder Class Submarine Torpedo Boat: Laid down as Adder, 3 October 1900, at Crescent Shipyards, Elizabethport, NJ ; Launched, 22 July 1901; Commissioned USS Adder, 12 January 1903, at the Holland Co., New Suffolk, Long Island, NY; Decommissioned, 26 July 1909, for transport to the Philippines; Recommissioned, 10 February 1910; Renamed USS A-2 (Submarine Torpedo Boat No.3), 17 November 1911; Decommissioned, 12 December 1919; Designed (SS-3), 17 July 1920; Final Disposition, designated for use as a target, 24 September 1920; Struck from the Naval Register, 16 January 1922. Specifications: Displacement; Surfaced, 107 t., Submerged, 123 t.; Length 63' 10"; Beam 11' 11"; Draft 10' 7"; Speed, Surfaced, 8 kts, Submerged, 7 kts; Depth Limit 150'; Complement, 1 Officer, 6 Enlisted; Armament, one 18" torpedo tube, 5 torpedoes; Propulsion, Otto Gas Engine Works gasoline engine, HP 160; Fuel Capacity 767 gal. ; Electro Dynamic electric motors, HP 150; Battery Cells 60; single screw. Photo from Western Kansas World. (WaKeeney, Kan.) 1885-current, 08 March 1902, Image 8, via chroniclingamerica.loc.gov. 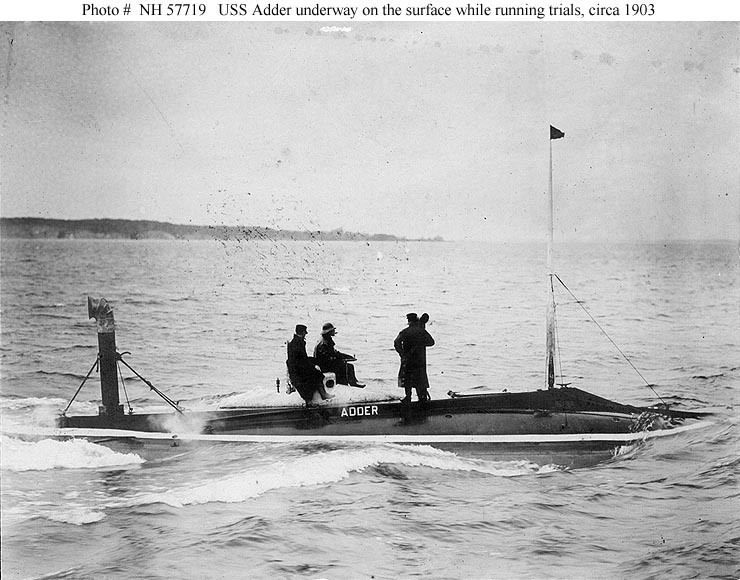 1.16k SUBMARINE BOAT ADDER (SS-3) ON SURFACE GOING ABOUT EIGHT KNOTS AN HOUR. Image and text provided by The New York Public Library, Astor, Lenox and Tilden Foundation. Photo from The Evening World. (New York, N.Y.) 1887-1931, 13 November 1902, Night Edition, Image 13 via chroniclingamerica.loc.gov. 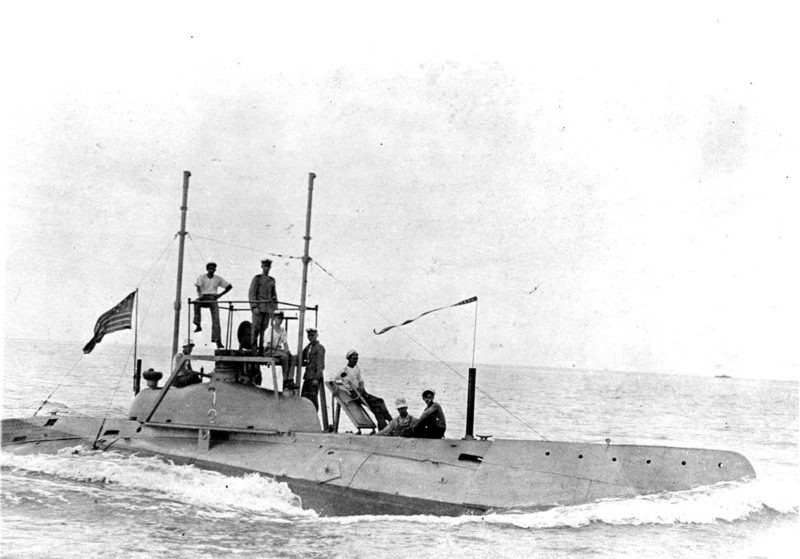 107k Moccasin (SS-5) Electric Boat Company/Holland Torpedo Boat Company facility, New Suffolk, Long Island, New York. 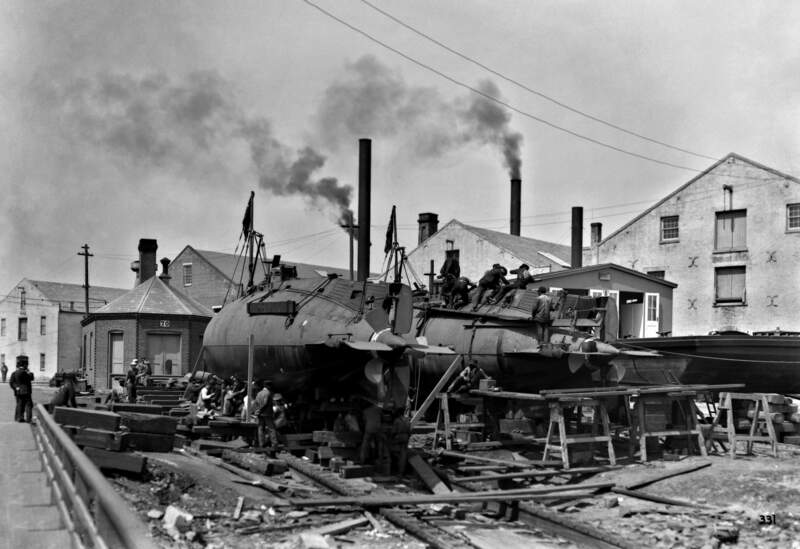 Submarines in the facility basin, circa 1903. Boats in the front group are (from left to right): Plunger (SS-2); Porpoise (SS-7); and Adder (SS-3). In the background, by the breakwater are (left-right): Shark (SS-8) and Moccasin (SS-5). Photographed by Legendre & Levick, New York. U.S. Naval Historical Center Photograph # NH 45937. 306k The Adder class was in effect, an enlarged production version of Holland with a much more powerful gasoline engine. With the dynamite gun omitted, the decking at the ends was no longer necessary and the superstructure was drastically reduced. The hull was enlarged so that men could move about erect on the internal deck, with plenty of headroom. In 1900, when advocating this design, Electric Boat argued that she would be handier and livelier than Holland, despite her greater size, because weights would be concentrated better near her center of gravity. For example, whereas Holland's ballast tanks were spread along her length, in this design the main ballast tank was no longer than the storage battery. It was designed to avoid the air pockets (with their free-surface effect) that could form in the earlier boat's ballast tanks. The air compressor had much increased capacity. The company argued that the most important single improvement was provision of a compensating tank that made it easy to operate in fresh or salt water. (Holland had failed a 20 April 1898 trial because she was trimmed wrong for New York Harbor, with its mixture of fresh and salt water). The scrap drawing shows the periscope and conning tower modification applied to Plunger . In the inboard profile, note the rods high in the hull that connect the steering gear to the control surfaces aft. Photo & text courtesy of U.S. Submarines Through 1945, An Illustrated Design History by Norman Friedman. Naval Institute Press. 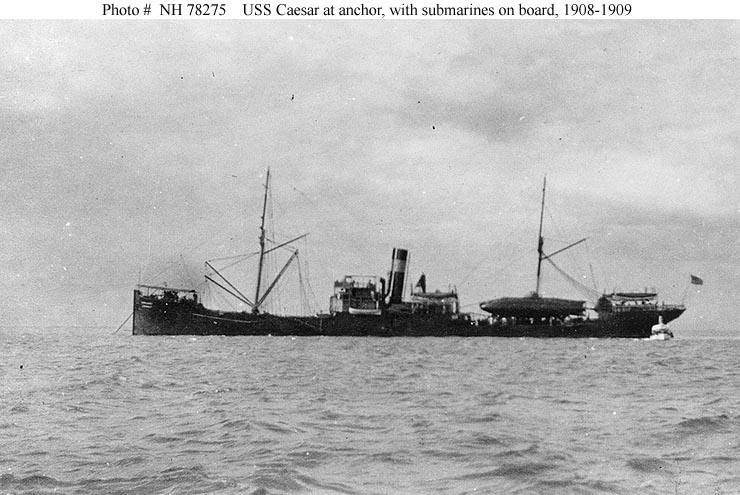 68k Underway on the surface, while running trials, probably in Long Island Sound, circa 1903. Note the yacht in the distance. U.S. Naval Historical Center Photograph # NH 57724. 95k Underway on the surface, while running trials, probably in Long Island Sound, circa 1903. Note the slicker-clad man at the wheel of her exterior conning station. U.S. Naval Historical Center Photograph # NH 57719. 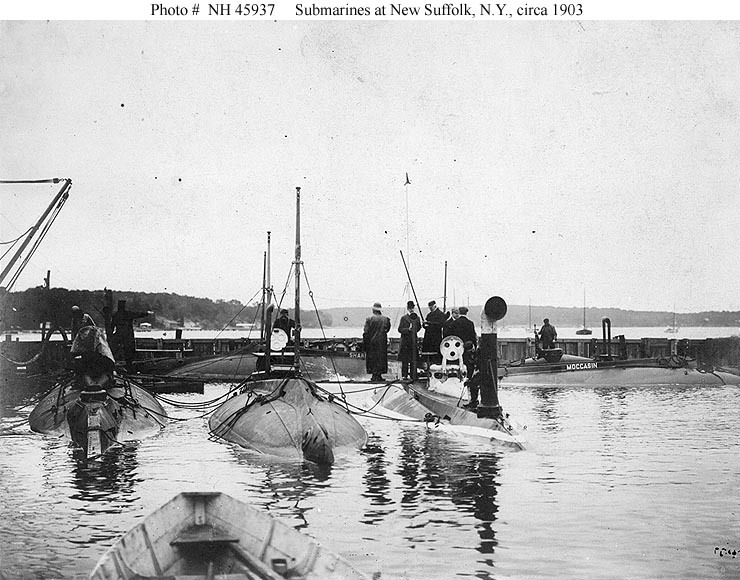 96k With other submarines, at the Electric Boat Company/Holland Torpedo Boat Company facility, New Suffolk, Long Island, New York, circa 1903. U.S. Naval Historical Center Photograph # NH 57728. The first real lively experience we have had with our new submarine boats was the almost complete wrecking of two of the finest in the navy during a recent storm off Norfolk Va. In the work of rescue the Peoria, Yankton, and Vixen lent conspicuous service. The present experience may lead to a new estimate of the value of submarines. Image and text provided by The New York Public Library, Astor, Lenox and Tilden Foundation & University of Utah, Marriott Library. Photo from The Evening World. (New York, N.Y.) 1887-1931, 05 December 1903, Night Edition, Image 2 & Deseret Evening News. (Great Salt Lake City [Utah]) 1867-1920, 02 January 1904, Last Edition, Part Two, Image 22, via chroniclingamerica.loc.gov. 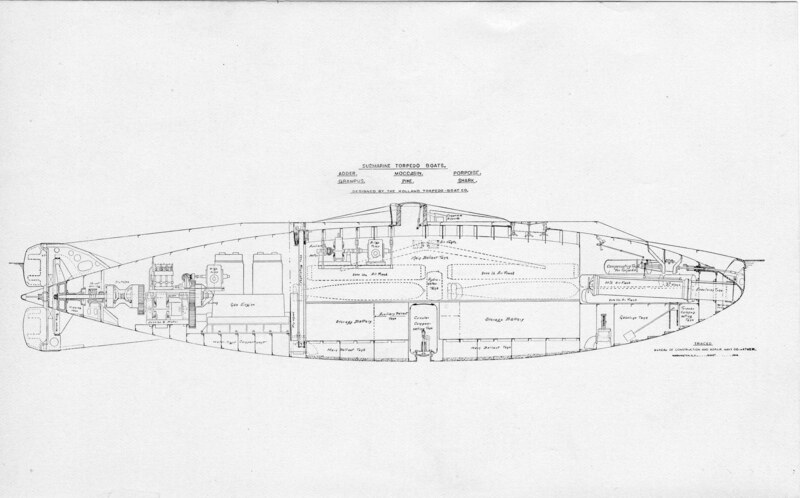 514k Tank layout of the Adder class submarine by Bureau of Construction and Repair, Navy Department August 1904. USN photo courtesy of Darryl L. Baker. 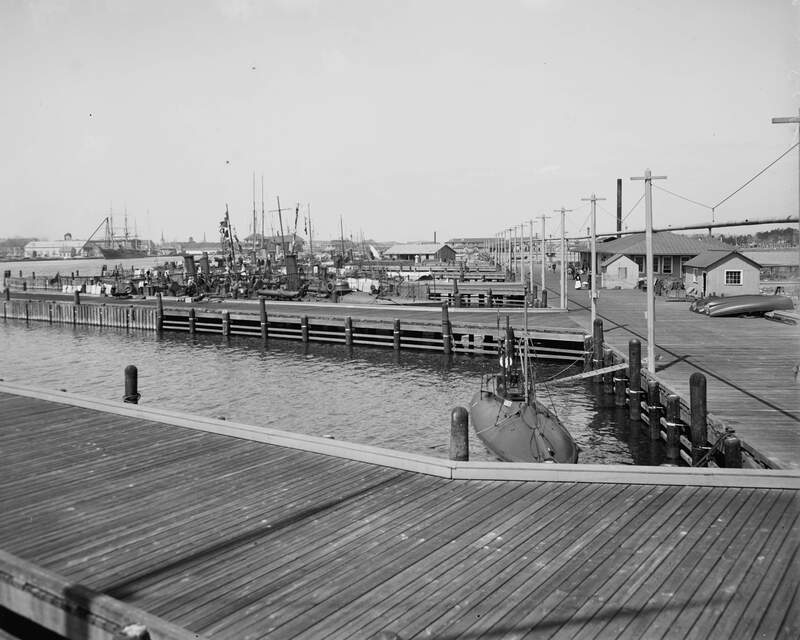 1.10k The Adder (SS-3) appears in the foreground at Norfolk Navy Yard, torpedo station, Portsmouth, Virginia 1905. Photo i.d. courtesy of Bill Gonyo. Photo # 4a17603v courtesy of LOC via Stephen Gower. 96k Perhaps the most important harbors submarines had to defend were those in the Philippines, which had to be held until the fleet could steam across the Pacific. 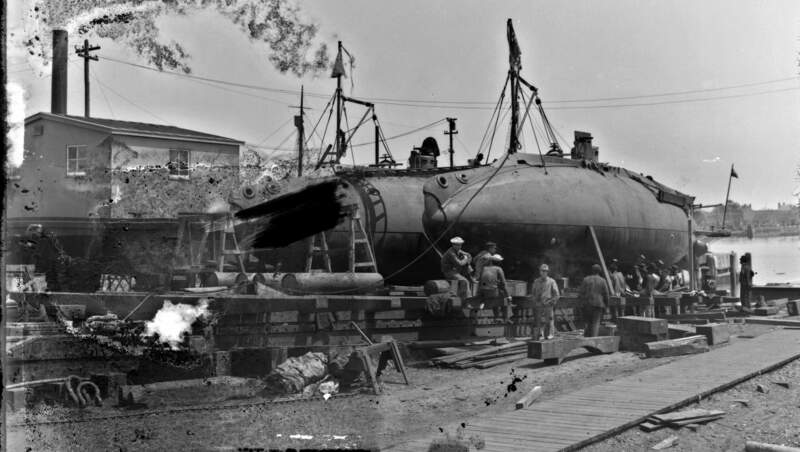 Early U.S. subs could not transit all the way there, so they were transported aboard colliers. 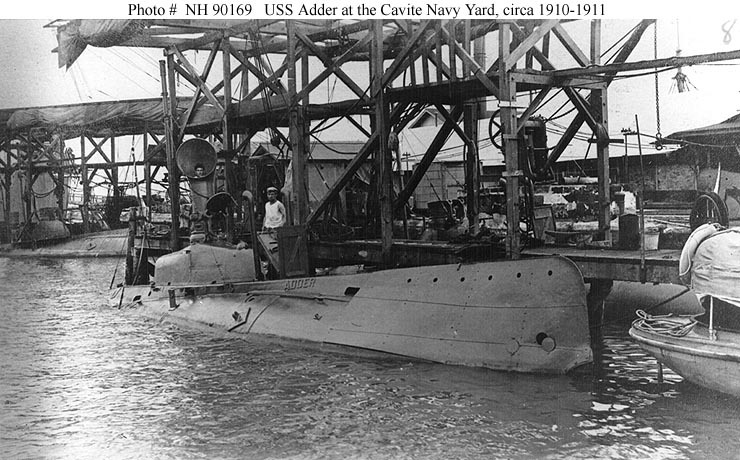 Here Adder (SS-3) is unloaded from the collier Caesar in 1908. Photo & text courtesy of U.S. Submarines Through 1945, An Illustrated Design History by Norman Friedman. Naval Institute Press. 259k Mohican sailors working on a boat - possibly the Adder (SS-3). 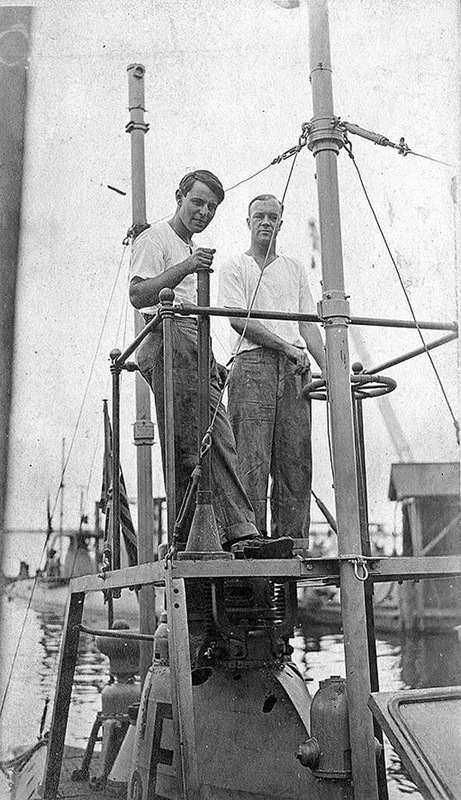 The man on the right is Victor L. Anderson, the other sailor is unidentified, circa 1910-15. 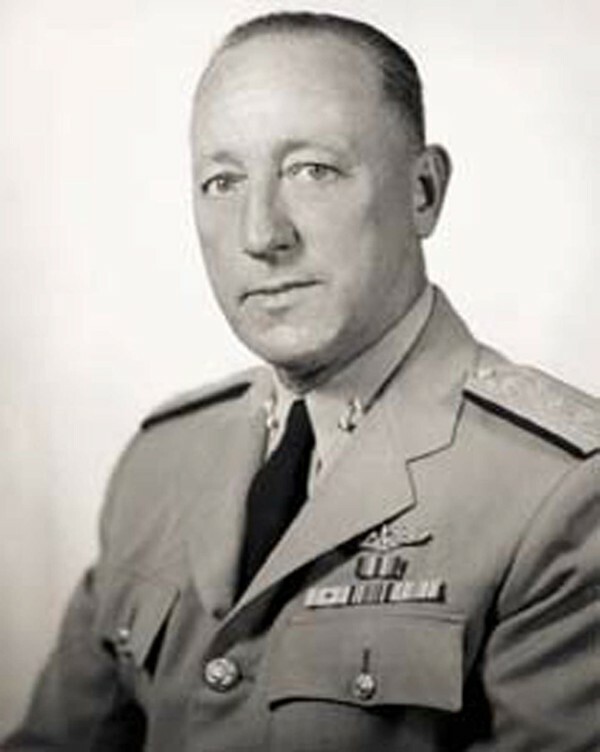 Photo from the Collection of Victor L. Anderson USN from tendertale.com via Robert Hurst. 110k At the Cavite Navy Yard, Philippine Islands, circa 1910-1911. Porpoise (SS-7) is in the left background. Note the man inside Adder's (SS-3) cowl ventilator. U.S. Naval Historical Center Photograph # NH 90169. Photo from Evening Bulletin. (Honolulu [Oahu, Hawaii) 1895-1912, 22 July 1911, 3:30 EDITION, Image 17, via chroniclingamerica.loc.gov. 65k In Philippine waters with her crew on deck, prior to World War I. 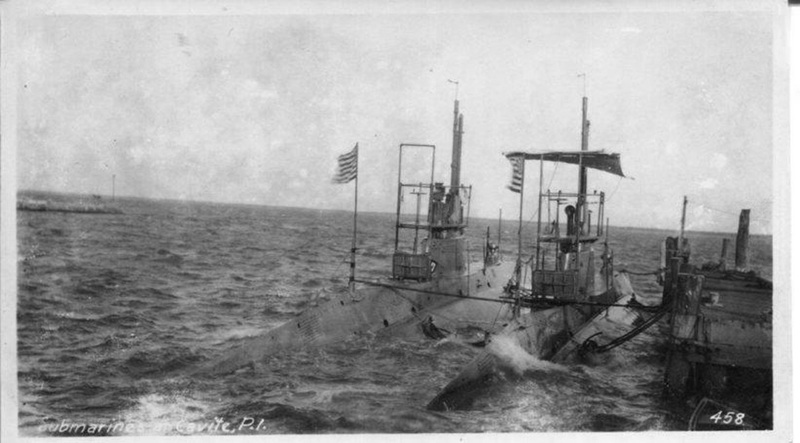 Note the 13-star "boat" flag flown by this submarine. U.S. Naval Historical Center Photograph # NH 84663. 311k A-2 (SS-3) moving by Mohican, post 1911. Photo from the Collection of Victor L. Anderson USN from tendertale.com via Robert Hurst. 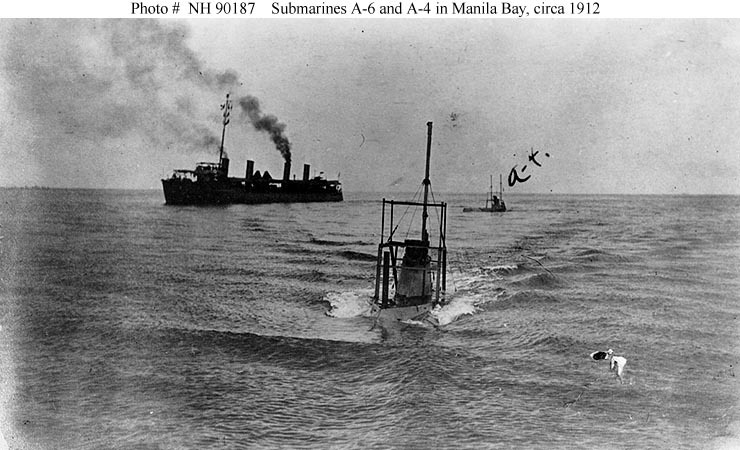 83k Moccasin (A-4) (SS-5) & A-6 (SS-7) underway in Manila Bay, Philippine Islands, circa 1912. A-4 (SS-5) and a Bainbridge class destroyer are in the background. U.S. Naval Historical Center Photograph # NH 90187. 122k Dewey Drydock, Olongapo Naval Station, Philippines. 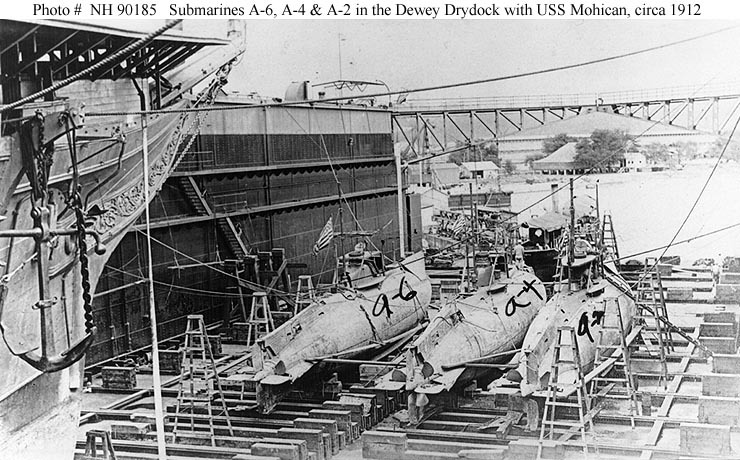 Submarines A-6 (SS-7), A-4 (SS-5) and A-2 (SS-3) in the Dewey Drydock, circa 1912. 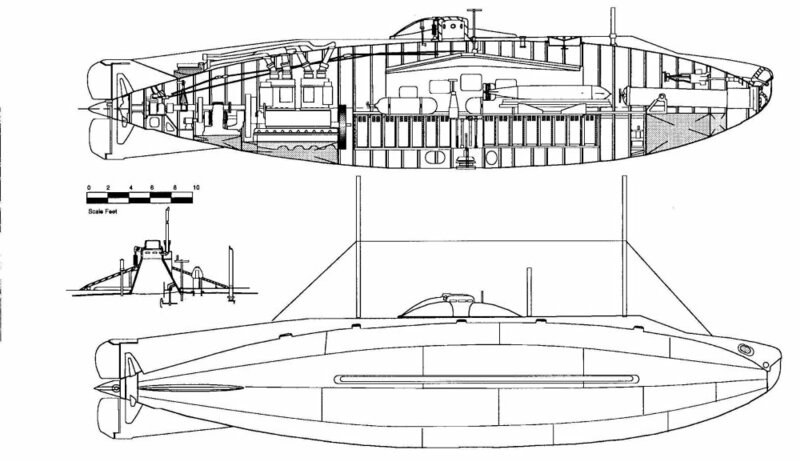 The boats show standard features: a single tall periscope abaft the conning tower; a conning tower fairing; and a bridge structure atop the conning tower, with the surface wheel atop it. This photo was taken before the boats had been fitted with forward periscopes. The bow of their tender, Mohican, is at left, with an anchor suspended from her starboard cathead. Photo courtesy of U.S. Naval Historical Center Photograph # NH 90185. Partial text courtesy of U.S. Submarines Through 1945, An Illustrated Design History by Norman Friedman. Naval Institute Press. 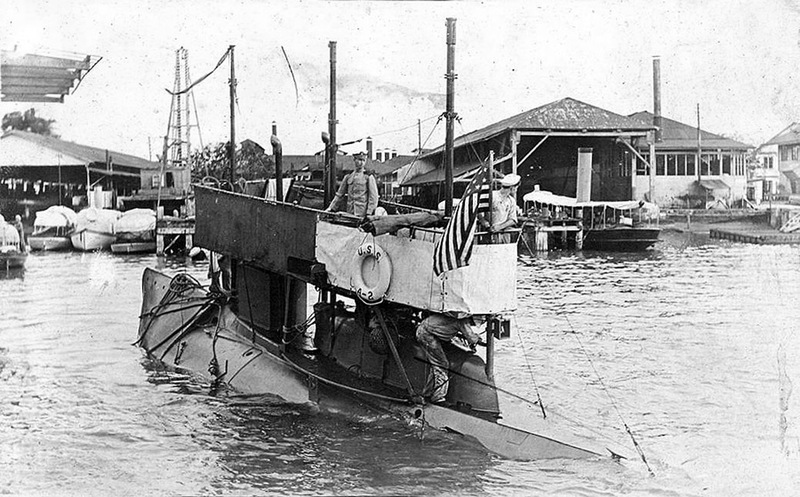 253k Loading an 18" torpedo, while at the Cavite Navy Yard, Philippines, circa 1912. 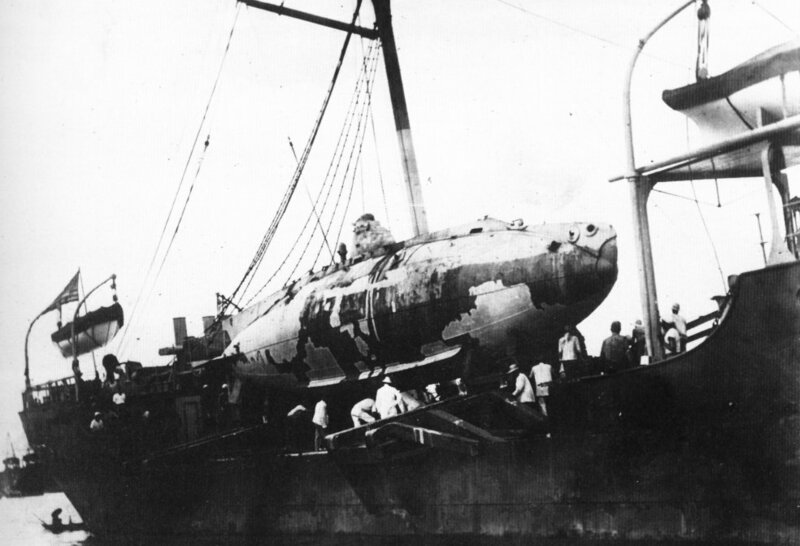 Note this early submarine's rectangular hatch. Text courtesy of U.S. Naval Historical Center Photograph # NH 90188. 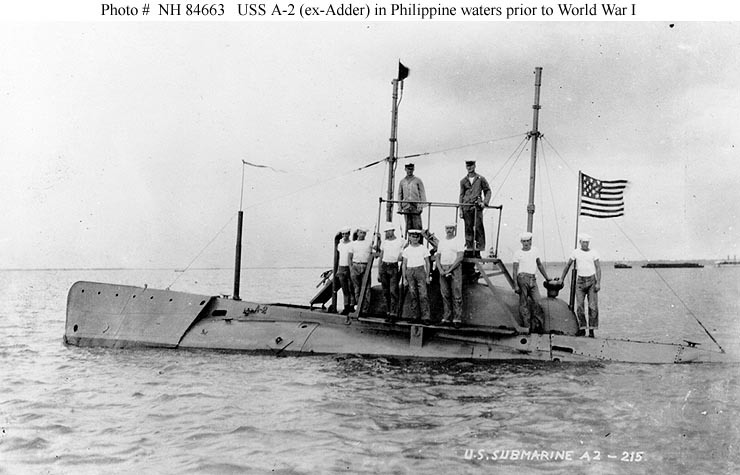 176k In the Philippines about 1915, Adder (SS-3) shows her false bow and her two periscopes protruding from her enlarged conning tower fairing. The object abaft the second periscope is an underwater bell for signaling; the noisy geared drives in these boats often rendered such devices useless. Text courtesy of U.S. Submarines Through 1945, An Illustrated Design History by Norman Friedman. Naval Institute Press. USN photo courtesy of ussubvetsofwwii.org. 514k Submarine base at Cavite. Manila, Philippine Islands. 455k Submarine base at Cavite. Manila, Philippine Islands. 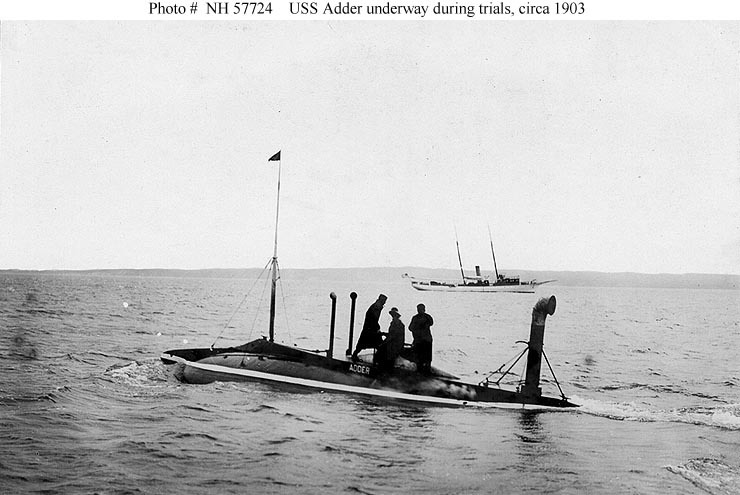 64k Vice Admiral Charles A. Lockwood was assigned command of the submarine Adder (SS-3) in 1914. He command the ex-German submarine UC-97 from March 1919 to August 1919, and the submarine V-3 (SS-163) from May 1926 to December 1928. The ex UC-97 was used to evaluate the capabilities of German submarine equipment. USN photo courtesy of Bill Gonyo. 31k Commemorative post mark on the occasion of the 100th year of Adder's (SS-3) commissioning, 12 January 1903 - 12 January 2003. Courtesy of Jack Treutle (of blessed memory).